Arsene Wenger is currently Arsenal’s longest serving and most successful manager. When he was appointed as the Gunners’ manager in 1996, a lot of fans of the north London club were asking themselves who exactly is Arsene Wenger and what makers him suitable to manage their great club? Wenger started his managerial career in 1988 where he joined AS Monaco as manager and he guided the club to the League Championship.in his first season in charge. In 1991, Wenger guided Monaco to victory in the Coupe De France, but their failure to regain the league title in later seasons led to his departure from the French club by mutual consent in 1994. After leaving Monaco, Wenger briefly coached Japanese J. League side Nagoya Grampus Eight. While manager of the Japanese side, Wenger won both the Emperor’s Cup and Japanese Super Cup during his stint. Wenger then joined Arsenal in 1996 and is credited by many in the English game as being responsible for the revolutionising of football in England in the late 1990s through the introduction of changes in the training methods and in the diets of players. In 2006, Arsenal made its one and only appearance in the Champions League final where they were beaten by a brilliant Barcelona side. After a period of nine years without a trophy, Arsenal were labelled by some opposition fans as bottlers, mainly due to the fact that once January came the team seemed to fall apart and only they only managed to grab the fourth Champions League spot by the skin of their teeth. One of Arsenal’s greatest critics on social media is Piers Morgan and he can always be counted on to air his grievances when Arsenal ate not doing so well. This dry period in the club’s history coincided with the club relocating to the Emirates Stadium from Highbury. In 2014 Wenger guided Arsenal to success in the FA Cup and last season Arsenal successfully retained the FA Cup. Alongside legendary manager George Ramsay, Wenger is the most successful manager in the competition’s history with six FA Cups. This season though has seen Wenger come under intense pressure from the fans. As is the norm with Arsenal, they have fallen apart since January and currently find themselves in third place in the Premier League behind their North London rivals Tottenham Hotspur. They are out of the Champions League losing over two legs to Barcelona and recently were knocked out of the FA Cup by Watford. For many fans this season was the season Arsenal would once again win the Premier League title, mainly due to how poor the so called top clubs around them have performed all season. Up until Christmas they were right in the thick of it. Rumours have started to emerge lately of player unrest, that superstars like Mezit Ozil want out of the club this summer have not helped Wenger cause on the pitch. With clubs that would normally be their rivals for the title capturing big name managers like Pep Guardiola and Antonio Conte (I know Conte is not yet confirmed but it’s only a matter of time in my opinion), the Arsenal board will be under pressure to do something to show their intent for next season. The only fear I have for Arsenal is will they suffer the same fate that clubs like Manchester United and Liverpool have suffered after they got rid of their high profile managers. It gas taken Liverpool twenty odd years to get the managerial appointment right when they appointed Jürgen Klopp as manager and Manchester United are still going through a crisis of identity since Sir Alex Ferguson retired three years ago. Who do Arsenal bring in to replace Wenger if the board decide a change is needed? With all the bigger clubs world wide securing their managers down to long term deals the available managers pool is very small unless the Arsenal hierarchy decide to break their current mould and pay big money for a big money manager and the most important question Arsenal fans have to ask will a new manager be able to work under the constraints that Arsene Wenger has had to work under over the last number of years. Whatever happens a certain section of Arsenal fans will not be happy, those loyal to Wenger will be aggrieved he is gone and those who want him gone will be cheering on the new manager. Like so many Premier League clubs the summer promises to be an exciting one for all those who follow the Gooners. Categories: Arsenal, Arsenal (NN), EPL Index Featured Article, and EPL Index Opinion.' 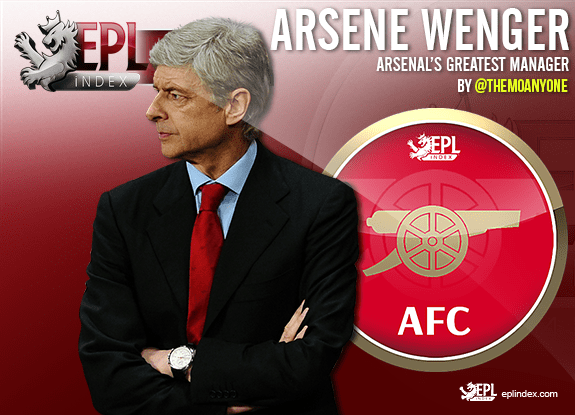 'Tags: AFC, Arsenal, Arsenal Stats, Arsene Wenger, and Wenger. out on if Thomas Lemar stays at Monaco? Arsene Wenger - End of the Revolution?